Todd Rose isn’t your average Harvard professor — but not because he dropped out of high school, spent time on welfare, and had 10 different minimum wage jobs and a wife and kid before he even finished being a teenager. Todd Rose isn’t your average Harvard professor because when it comes to people, the average is a statistical myth, he argues. There is no average. Repeat: There is no average. No average professor. No average worker. No average soldier. No average Joe. 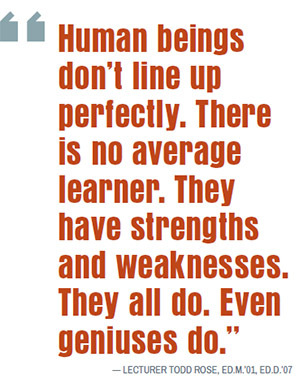 And what might just be the single most important lesson for educators: There definitely is no average student. Not one. Yet, as Rose, Ed.M.’01, Ed.D.’07, a lecturer at the Ed School and director of the Mind, Brain, and Education Program, writes in his forthcoming book, The End of Average, from the moment we’re born to the moment we die, we are measured against a mythical yardstick — the average human — and it’s hurting everyone. That’s why with this book and through his nonprofit, the Center for Individual Opportunity, Rose is on a mission to dismantle this myth of the average and instead help the public understand the importance of the individual. When it comes to school systems, Rose says it’s no accident how we got here: Schools were designed during the industrial age by people who were “absolutely obsessed” with averages because averages worked so well in managing factories. The goal wasn’t to nurture creativity and develop individuality. The system mostly accomplished what it set out to do: prepare students for standardized jobs in an industrial economy. Since then, we have continued to think that the average — a human invention — represents everyone or that any deviation from the average is what defines you. You’re gifted, and you don’t need as much help, for example. The Air Force concluded that Americans had gotten bigger over the past couple of decades and they simply needed to update their measurement of the average pilot. With the help of a young Harvard College graduate named Lieutenant Gilbert Daniels, they measured more than 4,000 pilots on 10 dimensions of size that seemed important for fitting into a cockpit — torso length and chest circumference, for example. The thinking was that once they redesigned the cockpit for the average pilot of the 1950s, controlling the plane would no longer be so troublesome. Most pilots, they assumed, would be within the average range on the majority of dimensions and that a good number would even be average on all 10 dimensions. Rose’s “aha” moment came when he was a doctoral student at the Ed School. Based on his own struggles in school, he came to Harvard interested in understanding individuals. 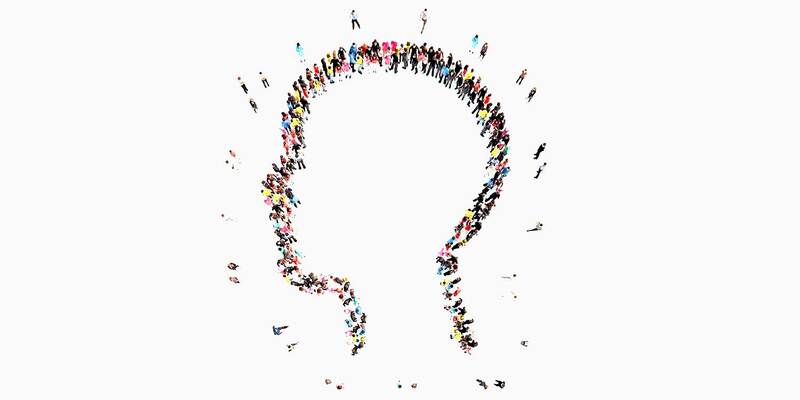 But, he says, “like everyone else in psychology and neuroscience, I had been trained to use group-level statistics as an undergraduate to study people.” When he was a teaching fellow for Professor Judy Singer’s statistics class, he remembers having a conversation with her about individuality. She told him that the statistics they were using were not meant to make claims about individuals, but rather about the population at large. Rose started seeing what she meant when he was doing his own research on kids who were struggling to read. Rose approached his mentor, Professor Kurt Fischer, one of the leading pioneers in the science of the individual and the brain, to talk about this dilemma — the reality of individual kids and what the research says — and why we think this way. In the context of schools, Rose says that while most of us will never need to worry about the flexibility of a fighter plane, we do need to worry about what he calls “the cockpits of our economy” — classrooms. We’re spending more on education and getting not-so-great results, but instead of looking at design and fit the way the Air Force did, we blame bad teachers. We blame lazy students. We even blame parents. “But how much of this problem is just bad design?” Rose says. Students are grouped in grades based on chronological age. Curriculum and textbooks are written to be “age appropriate.” Most standardized assessments, like the SAT or IQ test, are designed based on a comparison to a hypothetical average student. Walk into an elementary school classroom and even the literal design of the room is for the “average” kid: one size desk, one size chair, one size table. But just as there isn’t one size pilot, there isn’t one size student or one way to learn. “Human beings don’t line up perfectly. There is no average learner, ” Rose says. Every student has a jagged learning profile, too. The danger in not understanding and appreciating this, Rose says, is that we will continue not reaching all students. Fischer once told Rose that today’s schools basically fail about 80 percent of students. A student who struggles to read may be talented in physics, but that talent gets lost because math requires reading textbooks and worksheets. A gifted student may get bored and only do the minimal amount of work, which was designed for the average student. As a result, some students fall behind or act out. Others get ignored or eventually drop out. As Rose pointed out in a TedX talk on the topic, of the 1.2 million high-schoolers in the United States who drop out every year, about 4 percent, or 50,000, are known to be gifted. And even if a student “gets through, ” Rose says, he or she may never reach full potential. In order to do this, Rose says that rather than forcing students to fit to the environment, we need to have the environment fit each student, just as the Air Force was only successful when it stopped making pilots fit into to a one-size-fits-all cockpit. Rather than getting mad at a student with poor working memory who constantly forgets to write down homework assignments, a teacher could easily help that kid by verbalizing assignments and writing them down on the white board. Rather than making all students in a grade fill out the same worksheets, assignments could be customized. This issue of “fit” is exactly what helped Rose go from being that struggling student, the “troublemaker” with a 0.9 GPA in high school, to a Harvard professor with a doctorate. Fit, he believes, is the birthright of every person. And now, he says, is the perfect time to focus on individual learning. Using the technology we have on hand, educators can easily create learning environments that are flexible. Language translation programs, for example, can help students — at any school — better sound out puzzling words as they read. Rose says we have already seen how technology has helped scientists around the world understand the individual, leading to major breakthroughs in everything from cancer research to the treatment of diabetes. “And this only happened after scientists broke through a mental barrier, ” Rose says, “after they recognized this one all-important fact: that you can’t understand individuals using group averages” because there is no average cancer, no average cell, no average genome. So how do we, as a country entrenched in an education system that distributes standardized tests and groups students based on chronological age rather than rate of learning, break through its mental barriers and start to embrace — and demand — the science of the individual? Well, if you’re Todd Rose, you start by turning to Hollywood. Walter Haas, a founding director at Rose’s nonprofit, specializes in digital marketing and has worked on projects for Levi Strauss and Rudy Giuliani’s presidential campaign. He says getting the message to people is a first — and critical — step. It’s the same approach, Rose says, that the Harvard Alcohol Project took in the 1980s, when it teamed up with every major movie studio and television network to help launch a new term into society that resulted in demand from the public: the designated driver. With the help of Hollywood, over the course of just four years, more than 160 popular movies and shows like Cheers and L.A. Law added designated drivers into scenes and drunk driving prevention into dialogue. PSAs flooded the market. The term “designated driver” even officially appeared in Webster’s Dictionary in 1991. “It is such a terrific example of what is possible if you combine a good idea with a clever approach to getting it to the public, ”Rose says, noting that he is starting to team up with Hollywood in the same way. His nonprofit is also creating partnerships with non-Hollywood groups that can also make a difference, like Teach For America, which places young teachers in high-needs schools, as well as influential companies that create tests for schools. They also plan on creating a free flexible digital textbook that will allow teachers to customize learning for each student. The bottom line, Rose says, is that we all need to ask ourselves who we are supposed to be as a country.